Your body takes a hammering on race day and so does your kit. Having a decent pair of triathlon cycling shoes can give you that extra edge to beat your personal best. Personally, we think the Louis Garneau Tri-X Tri Shoes are one of the best pairs of shoes out there right now and well priced for such high quality. I remember my first couple of races with borrowed gear and a pair of old runners. Great memories but things have moved on since then. I also remember the first time I bought myself a shiny new pair of triathlon racing shoes. That was a fun day but after some research and a quick trip to the local triathlon store and I was back in action with a new set of pedals. At this point, the new pedals and the shoes were worth more than the bike. So what should you look for in a new pair of tri racing shoes? The Tri X-Speed shoe has everything you need for triathlon racing but well within what we consider a low price point. These shoes carry all the latest features you would expect from a high-end pair of racing shoes. First up there is the easy strap fastening system. It’s a hook and loop fastening setup that keeps the fastening loop in place even when the shoe is fully open. These are great because you can leave your shoes clipped into the pedals, attach the generous heel loops to the frame with small elastic bands to hold them in place and perform a running bike mount at the start of the bike section. They have a reinforced outsole that keeps everything lined up nicely in the pedals. Couple this with what Louis Garneau call their HRS-80 retention system and you get that connected feeling when you are locked into your pedals. On warmer days the well-ventilated insoles and shoe help to keep things that bit cooler. Another feature we like is the moulded treads on the outsole. Having tried many different makes of bike shoes these are critical – especially in triathlon because you may have to run to the mount point and run back to the transition from the dismount point. Ventilation is superb and keeps your feet nice and cool throughout the race. Comfort and fit are excellent thanks to the anti-slip heel system and the full strap that adjusts the whole upper of the shoe to mould around your foot. These shoes are super lightweight which for serious triathletes is critical. They feel very solid underfoot and once strapped in it’s like you are connected straight to the crank arms on your bike. The only thing to watch out for is the size. Like all brands, they have their own sizing chart so I’d highly recommend ordering a size bigger than normal. The strap system compensates for any slack you may have and once fastened up properly they fit like a glove. In this review, we are going to highlight some of the things you need to look out for when choosing new cycling shoes for your next triathlon. These are tips we have picked up along our triathlon journey and by talking to some of the more seasoned professionals out there. First up let’s look at why you should even bother getting yourself tri specific shoes. It comes does to three main things really – speed, weight, and comfort. We will examine each of these in a bit of detail now. Let’s take a look at speed to start with. You will notice that almost all triathlon-specific cycling shoes have velcro straps to hold them in place instead of laces. This is very deliberate and can help you shave valuable seconds off your transition times if you can master the art of putting them on quickly. As an example here – my tri shoes never leave the pedals on y bike unless I am cleaning them after a race. They stay firmly clipped into the cleats all the time. Before I start any race and during setup in transition I clip my shoes into the pedals and tie an elastic band into one of the loops at the back of the shoe. The other end gets wrapped around the back axle of the wheel to hold everything in place. This setup allows me to run my bike straight out of T1 and up to the start line of the bike course without slipping about in my shoes on the road. Also because I have the shoes locked in place up out of the way with the elastic band they don’t drag along the ground. When I get to the start line I am already sprinting with the bike so hop up onto the saddle, dive a foot into one of the shoes and tighten the velcro strap. Then in goes the other foot and once I have the velcro strap tight I start cycling. This breaks the elastic band and off I go. Weight – The shoes need to be lightweight. Some of the more expensive shoes are made from composite and carbon fibre so are extremely light. Comfort and Fit – You won’t be wearing any socks so the insoles should be soft enough and be a snug fit. Breathable – You want to feet to be able to breathe. Any decent brand of tri shoe will have a series of vents to help with this. Makeup – Nearly all shoes are made from composite materials but the insoles and inner sock material should be the best quality you can afford. Not just for race day but when you take them off they should not poison everybody with the smell. Heel Handle – This is hugely important. Especially when you start with your shoes already clipped into the pedals. The last thing you want to be doing is fumbling around trying to get your shoes on when you should be racing. So let’s look at the previous setup for a second and see where we shaved off those valuable seconds. Firstly I didn’t have to stop in transition and put on my shoes. I had my wetsuit half off before I even got to the bike. Triathlon shoes need to be comfortable because more than likely you are going to be wearing them without socks.This seriously reduces time in transition because you are not trying to drag socks onto wet feet. Try doing this after a shower and you will know what I mean. The fact that the pedals were already clipped into the pedals and held in place with the rubber band saved me a huge amount of time because I could run with the bike – try running on the road at any speed with a pair of bike shoes on your feet and see how long it takes for you to end up flat on your back. Lastly, the velcro straps mean you can get fixed into your shoes in seconds and start racing. Most people don’t wear any socks when competing in a triathlon so make sure the shoes you buy fit properly. They should be snug but not tight. All good tri cycling shoes have vents to let your feet breathe so a snug fit doesn’t cause any discomfort. Think of it this way. Because of the cleats on the bottom of your shoes, you are basically connected to the pedals. This should feel solid but controllable and if your feet are sliding all over the place in your shoes then you are not going to be able to perform at your best. Plus you risk causing injury or blisters when out on the road. Remember you still have to run a minimum of 5k after the bike race is finished so look after your feet. 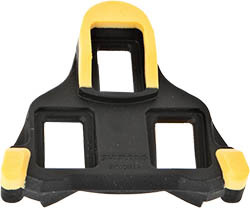 There are two main types of pedals on triathlon bikes and each has their own style of cleats – these are the yellow clips on the underside of your shoes. New bike shoes don’t come supplied with cleats so make sure you pick some up. These are the three hole cleats as I call them. There are three holes in the cleat to fix it to your shoes and are pretty much the standard when it comes to road bike shoes. They have a great surface area which gives you solid contact with the pedals. You push the front of the clip in first and then press your foot down on the pedal to lock it in place. Using clips on pedals can be a bit scary at first but once you get used to them you will never look back. The feeling of being connected to the pedals gives you superb control and extra power all the way through pedalling motion. To unclick you twist your foot sideways and the cleat pops out of the pedal. Like everything, you get what you pay for, but you do not have to spend a fortune on a decent pair of tri shoes. Just make sure you go for a reputable brand and something with a Velcro strap and lightweight if possible. Anything by Giro, Luis Garneau, Shimano or Pearl Izumi will do you well. 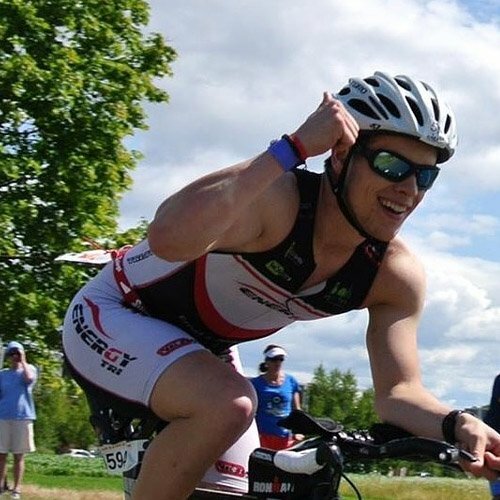 Here is a quick video from Michael Fox of Fox Endurance Racing showing you how to use the rubber band technique to hold you tri shoes in place during the transition. Try it out – worked wonders for me and my transition times.